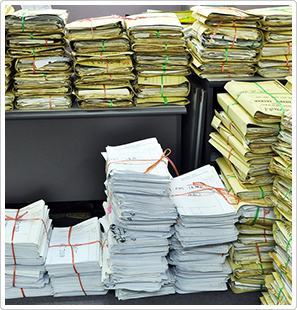 If you are a business owner, then you probably have many important documents lying around your office building. If you are a homeowner, then photographs and other records are sure to be found in your closet or on your coffee table. Have you ever thought what would happen if all of these records were damaged or decaying? It may hinder your ability to operate as a business, and it may erase thousands of memories from a family. Whether your documents have been damaged due to improper storage or natural disasters, our document recovery specialists can bring them back to life. We can clean these materials of dust, mold, water and any other decay. Our experts will keep a secure inventory of your documents and identify if there are any health and safety hazards. With our document recovery process, you can rest assured that your records will be restored as quickly and effectively as possible.